For decades, folks in both Pattaya and Hua Hin have looked across the Gulf of Thailand and wished they could leap to the other side, Superman-style, in a single bound. The straight-line distance between the two resort cities is just over one hundred kilometres but by land it’s a grinding, 350km drive via the grand snarl auto of Bangkok and Co, which takes up to five hours. The two towns were like lovers stuck on opposite sides of a river with no way to get across. And now they can. A new, direct ferry service across the Gulf that launched in January 2017 has not only survived but thrived. The Royal ferry is a sleek, high-speed catamaran that edges out of Pattaya’s Bali Hai Pier at ten o’clock on the dot each morning to then scoot across the Gulf. Two hours later it docks just south of Hua Hin at Khao Takiap, and later departs for Pattaya at one pm. Hua Hin is the most popular tourist destination in Prachuap Khiri Khan province. 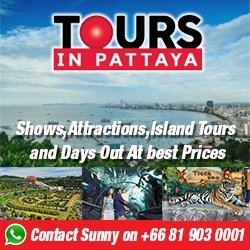 Being home to a royal holiday palace, it has retained the sense of decorum that Pattaya never really bothered about. Instead of bar-hoppers and jet-skis, you’re more likely to find golfers (and then more golfers), with this region being home to ten world-class courses. The town’s long, shallow beaches are generally free of deckchair slums and banzai speedboats, and come evening, you can max-out on eating and shopping at night markets. The most authentic one is still the original, midtown melee on Soi 72. But, you might protest, Pattaya has the same tourist trinket-trash markets, plus golf courses galore and beaches, so why pay the ferryman to go see same-same? Because, having briefly box-ticked Hua Hin’s options, you then get to run yourself out of town on a rail. Head to Hua Hin’s historic railway station and hop a train south to the real Prachuap, a land of plenty minus the resort sprawl and shout-fest tour groups. Like it’s full name, Prachuap is a long and lyrical sort of province. Exploring its beaches that loop from headland to headland you find sea pines and fishing boats instead of hawkers and high-rise. Take Baan Grood for instance, 100 km south of Hua Hin.This snoozy seaside town — more like a large village — is also known as Ban Krood, Ban Good, Ban-Kood, Bangrut and other variations. (My preferred version, as used on the railway timetable, is Ban Krut, meaning “bankrupt” in Indonesian.) You’ll see few faranghere except for a handful of defrosting Scandinavians who pass the day in leisurely cycling or beach basking like bronzed whales. An endless beach stretches south from Baan Grood with low-rise bungalow resorts lining its parallel seafront road. Cycling the grand corridor of palms and sea pines that shade the beach for miles is my morning heart-starter. I stop anywhere and swim in the windless sea, and then cruise back to the resort for breakfast. It might be an Accor-free coast but this “sunny side of the Gulf” (as it is known) is in fact a favourite of in-the-know Thai families. Thus the numerous bungalow resorts. The absence of a convenient local airport is a contributing “plus” to the tranquility of life here — a place in the sun that you have to earn. So, what’s there to do in Baan Grood? Visit a temple, swim, sun-bake, read, grab a massage and dine at the little thatched restaurants along the sand. Cycle and repeat cycle. Like visiting Casablanca for the waters, if you’re here for the neon stars and jangle bars, you’ve been misinformed. Another 65 km further south down the line, just off Bang Saphan Noi, sits equally-unsung Koh Talu. The hilly, jungle-clad island is privately owned although a large part is slated to become national park. The sole resort has comfortable, Thai-style bungalows overlooking the white sand arc of Big Bay and the smaller, absurdly pretty Pearl Bay. Meals at its restaurant happen languidly to the sound of waves lapping beneath the wooden deck. A list of might-do’s (as opposed to must-do’s) on this the 1500-ha, whale-shaped island includes snorkel, bushwalk, read, kayak, snooze, email. Again, repeat cycle. For variety I check out the hawksbill turtle hatchery along the beach, try squid fishing at sunset and join in with the resort’s coral reef replenishment project. And then I must ask, “Do I really have to leave tomorrow?”I console myself with a farewell massage at dusk. The masseuse interrupts her vigorous pummelling (well, I asked for it) to say, “Look. Batman over the beach.” Huh? I think — we’re ten kilometres offshore on a superhero-free coast. “Yes, Batmans, many small ones. See,” she insists. I look up to see a dark, shadowy wave rising above the island ridge. It is the nightly exodus from Koh Talu’s caves of hundreds of thousands of bats — batmans — going out I suppose to party all night and fight crime?